Mark Hyman, MD, was co-medical director of Canyon Ranch for ten years, and is now the chairman of the Institute for Functional Medicine and founder and medical director of The UltraWellness Center. 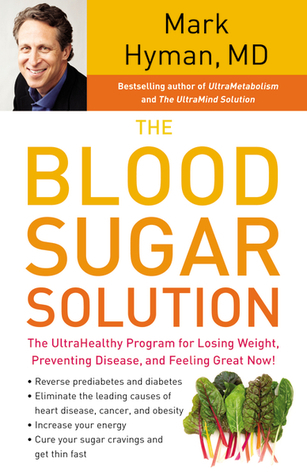 He is the New York Times bestselling author of Ultrametabolism, The Ultramind Solution, and The Ultrasimple Diet, and coauthor of Ultraprevention. The title of this book is a bit misleading since it covers more than just blood sugar. Once you get through the introduction and history of *diabesity* which runs about 70 pages, the information about eating and exercise are pretty spot on. My last two blood tests showed that my glucose levels were elevated and I needed to do something to avoid my own family history of diabetes. I am not overweight but I really wasn't eating properly. The book goes into detail about which foods actually reduce your blood sugar and relieve other problems like inflammation, head aches and fatigue. 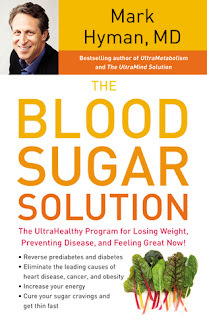 Even if you don't have issues with blood sugar, this book has great information just about living healthy. So far, I have reduced my sugar count just by eating better food and exercise, so there really isn't much magic as far as accomplishing that. This book provides an excellent guide if you don't have access or the means to have clinical support in getting healthy. The plan is really simple and most of the foods are readily available. There is a handy recipe guide in the back with an index to help you find them easily. I can't tell you how many books like this don't include that simple thing. One thing I haven't read in a book like this is about chemical sweeteners, which it turns out can be pretty evil. I still crave my one diet soda a day, but maybe in the future I can start replacing it with a healthier drink like green tea. Overall, this is a great book to get started with if you want to change your life and make a committment to healthier living. +1 Leave a comment -- you can do this daily, just leave me an email or twitter address! Great giveaway! I have a problem with blood sugar being low or all over the place, so I think this book would really help! I think this book would be very useful, and I would love to read it. Thanks for this chance. Sounds like a great source of information for eating better...it is hard to kick that soda craving. I can do it for a while, but then bam, I have one again. This sounds great. I saw the author in a short CBS This Morning segment and I'd like to know more.